I was undeniably smitten with Slovakia when I made brief stops to two of its wonderful villages this year: Oravsky Podzamok and Vlkolinec. Commonly referred to as an off the beaten path destination in Europe, this was a gem that I hope everybody would soon seek out as a getaway because the natural beauty of this country was incredibly vivid right from the moment that I set my eyes on it. Though I didn’t have the chance to explore its capital, Bratislava, as well as its other popular districts, the places that I’ve been to were enough to make me yearn for more. With that in mind, I’m already planning on a 2nd voyage! And what better way to anticipate that than to ask Slovaks for some interesting facts about the country as early as now? So today, I present to you, Maya and Michal who will talk about this wonderful country that’s smacked right in the heart of Europe! We are Maya and Michal, born and raised in Slovakia. After studying in our capital of Bratislava, we started to crave adventure. So we quit our jobs thereafter, packed our bags and moved to Canada. That was over 3 years ago and we couldn’t be happier about our decision of living abroad. 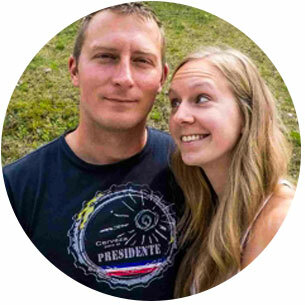 In 2015, after many questions from friends and family, we started a travel blog where we document our trips around Canada and beyond: Travel with the Smile. I’m sure many expats would agree that the longer you live abroad, the more you miss some parts of your home country, that’s why every time we go for a visit, we always plan a getaway to Slovakia’s nature. In a nutshell, some important facts about Slovakia: Slovakia is a small country at ~49,000 km2 in Central Europe with a population of 5,5 million. The capital and the largest city is Bratislava and the official language is Slovak. Since joining European union in 2004, Slovakia’s currency is the Euro, and we have everything from unique castles, caves, mountains, hot springs, folk architecture and more. Slovakia is such a small country that only very few people actually knew where it is after asking me where I’m from. Trying to help them place my home country on a map doesn’t help when I try to explain that Slovakia is located in Central Europe. There are so many definitions of Central and Eastern Europe, that it really depends on the source you are using whether you find Slovakia in Central or Eastern Europe. And yet this is not the only common misunderstanding from foreigners. They also confuse it with Slovenia. Even George W. Bush and many other politicians have mistakenly talked about Slovakia and Slovenia. It resulted in regular monthly meetings of staff from Slovak and Slovenian embassies to exchange wrongly-addressed mail. 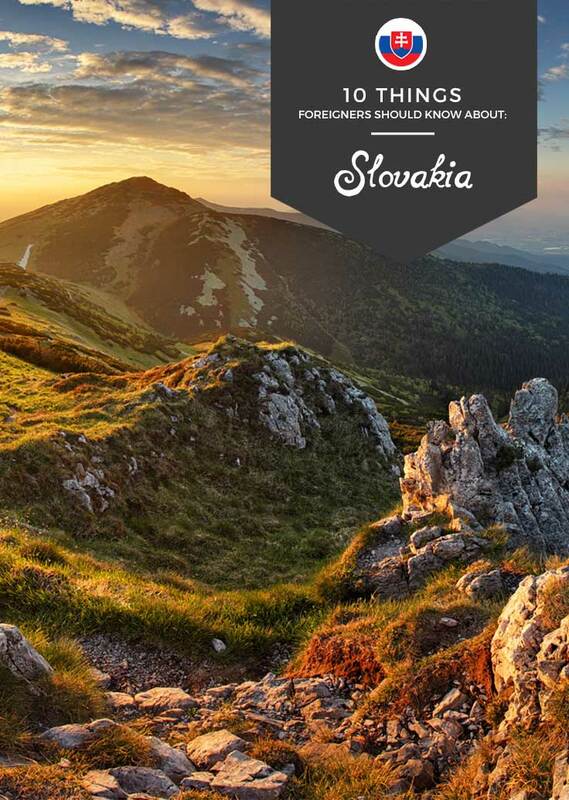 With 9 national parks and 14 protected landscape areas, there is a lot to choose from when visiting Slovakia. Most of them are located in central part of the country, and the best part is you can visit them by using public transport! The best known park is the High Tatras with peaks over 2500m, and it is a popular place for hiking and skiing. Meanwhile, Slovak Paradise is popular for exploring the caves; whereas Low Tatras is the largest national park full of mountains and green valleys — our favourite for mountain biking. One of the most interesting things about Slovakia are Slovak folk dances. Influenced by the region and a way of living, dances and folk costumes are different and colorful. In fact, there are more than a hundred folk groups in Slovakia and the dances are brisk, full of temperament and accompanied mostly by cymbalo, violin and bass. Maya is a former folk dancer and used to dance in a folk group. Many folk performances are held at the festivals around and during summer. See yourself how beautiful and unique our folk art is in this video. There are more than 1,600 officially registered springs, many of them used as a source of mineral drinking water and the others are thermal springs for relaxing spas. You can buy bottled water from Slovak springs in every store – each type has a different benefits for your body. The biggest area for swimming is in Bešeňová, where 33 springs can be found. The world rarity are hot springs in Podhájska – the water is said to have more beneficial effects than the famous Dead Sea water. Slovakia has 180 castles and 425 chateaux – huge numbers for a small country! So wherever you go, you will see at least one castle or chateaux. The most popular of them all is Spiš Castle, which is also one of the largest in Central Europe (it is included in the UNESCO List of World’s Cultural and Natural Heritage). For us though, the most beautiful castle is from our hometown of Trencin (pictured above). The picturesque village of Čičmany is located near Strážov Hills in northern Slovakia. It is the first-ever folk architecture reservation in the world and the 1st mention of the village dates back to the year 1272! There are more than 130 houses that belong to this area and the wooden houses are painted with different folk ornaments, some of them appearing on the people’s folk costumes. More than six thousand caves have been discovered in Slovakia. Most of them can be found in the national parks of Low Tatras, Slovak Paradise and Slovak Karst, and they truly are unique natural wonders. For instance, Ochtinska Aragonite Cave is called “freak of nature”. Instead of classic stalagmites and stalactites, you will find white aragonite twigs and bushes. Did you know? There are only four accessible aragonite caves in the world, rest of them are in Czech Republic, Mexico and Argentina. Slovak language belongs to the Slavic language family. It is sometimes called “Slovak Esperanto” because it is the most comprehensible language for the speakers of other Slavic languages. Kosice Peace Marathon is the oldest marathon in Europe and the world’s second oldest (after Boston Marathon). It is held every year in Kosice, in the eastern part of Slovakia, on the first Sunday in October. Slovakia’s national dish is called “Bryndzové halušky”. They are potato dumplings with a special kind of fermented sheep cheese called “bryndza”. It is best prepared with pieces of fried bacon on top! This is a very unique and popular meal which can be found in most of the restaurants. Quality varies so make sure to check beforehand the best place to get bryndzové halušky. If you’re from Slovakia like Michal and Maya, do you agree with the 10 points that they wrote about the country? Maybe you have something to add too? After learning of these facts, you bet that I’m very excited to come back! For sure I am eyeing on a trip to its national parks as well as the famed High Tatras! How about you? If you’re a Slovak, do you agree with the points that Maya and Michal made? What else can you add? If you’re a foreigner, what points do you find interesting or intriguing? Would you want to visit this country? Oh my goodness! Everything looks so beautiful. This is definitely a part of Europe I would love the opportunity to explore one day. I'd love to see the castles, mineral springs and even the caves! That would be an adventure! It looks absolutely stunning. I had no idea about slovakia so this is great information. Looks like a place my husband I would like to visit one day. After reading this post, I am adding Slovakia to my list of places I will dream about visiting one day/someday. The picture are beautiful and I would love to tour the castles and chateauxes. I would love to try this cheese as I am a big cheese lover and the Bryndzové halušky looks delicious. Your pictures are beautiful! I have heard of SLOVAKIA, but never knew to much about the country. I am shock of that they have 1,600 mineral springs they would be awesome to see and explore. Thank you so much for sharing the information. Thanks! (Photos are from my guest writer, though ;) Also, I was shocked by that as well. There's really so many amazing things in Slovakia! I would love to go somewhere like that. I just love the natural beauty in the springs, the caves, and even the landscapes. Can you imagine living in a castle like oh my. It's like a picture from a story book! Thanks for sharing. I love the idea of this blog series--I really learned a lot from this post!! The photos are absolutely beautiful! I'm most interested in seeing all of the castles and caves. Hopefully when my kiddos get older, we can travel more! I am far from familiar with Slovakia, but after reading this, I want to visit so bad! We love to explore whenever we can, especially caves and springs. I think it would also be really neat to see castles up close and personal, they've always intrigued me. Just WOW.... I am in awe over the photos and everything! Such a beautiful place. I find that there are so many places in the world like this one that are just hidden gems and I think they should stay that way sometimes. I hope to travel one day. Each time I come to your blog I am in Awe over places! That's where we're planning to go this late summer/autumn! Tks for the info! I lived in the Czech Republic for six months and never made it to Slovakia.... wow, I'm really kicking myself for that now. Will have to add Slovakia to my upcoming Southern and Central Europe trip to rectify that mistake!